Jeremy Middleton CBE, who is standing as an independent candidate for the North East Mayor. North East mayoral candidate Jeremy Middleton has announced that, if elected, he would refuse any salary offered to him for the role along with any expenses. Following the agreement of the North East devolution deal, the region will elect a mayor for the first time in May 2017 and, so far, one candidate has announced his candidacy. 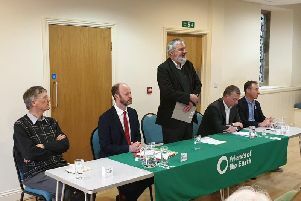 Mr Middleton, who recently stated that he intends to stand as an independent candidate and that politicians should work in the interests of the region rather than political parties, has said he would donate any salary for the role to local charities. The former Conservative also announced that as mayor he would appoint an all-voluntary cabinet to advise him, made up of senior figures from the public and private sectors, who would also receive no salary or expenses. He said: “If elected as Mayor of the North East, I will not receive a single penny in salary, allowances or expenses; not one penny. “If it is decided that the mayor will have a salary, I will donate this to North East charities. Our region does not need more career politicians on the payroll. “The political establishment in the North East has largely been made up of the same people pushing the same party political lines for years. He added: “North East devolution is happening, so now people of all political persuasions need to work together to make it a success.